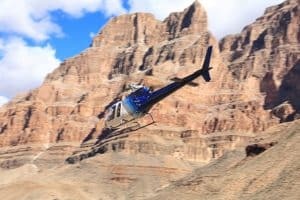 On February 10, 2018, a group of friends took a helicopter tour from Las Vegas to the Grand Canyon. They were visiting our country from Britain, to celebrate Stuart Hill’s 30th birthday. Just shy of 5:30 pm, the EC-130 helicopter, operated by tour company Papillon Airways, crashed near Quartermaster Canyon on the Hualapai Nation. Three passengers – Stuart Hill, his brother Jason Hill, and his girlfriend Becky Dobson – died in the crash. Now, the crash has claimed the life of two more victims: Jonathan Udall and his wife, Ellie Milward. Mr. Udall spent 12 days at the University Medical Centre of Southern Nevada before he ultimately succumbed to the burn injuries he sustained in the crash. His wife’s cause of death has not been officially determined yet. As of this writing, the pilot and one additional sight-seer are still in critical condition. The first responders on the scene faced terrible conditions. The wind was severe enough, and the shape of the canyon rugged enough, that the rescuers had a 20-minute hike to get to the crash site. According to a CNN report, Nellis Air Force Base sent additional support to the rescuers. That the first responders were able to get there and working within 30 minutes is extraordinary, given the conditions. Without their help, all seven people may have died at the scene. The new system will not prevent fires, but it does slow fuel leaks. This allows passengers and pilots involve din crashes a better opportunity to escape a helicopter after it crashes. This is not the first time Papillion has been involved in a fatal crash. In 2001, a helicopter went down in Meadview, Arizona. Six people (including the pilot) died, and only one survived, though the survivor lost both her legs as a result. A crash in May of 2014 led to the death of a Papillion pilot (there were no passengers on board at the time). A trainee pilot died in 1999, as well, after hitting a tree while flying. All of these incidents, however, are related to Grand Canyon tours. Papillion operates in multiple states. A 2011 piece by the Los Angeles Times said that up until that point, Papillion Airways had 15 accidents (four fatal) between 1985 and 2011. Helicopter tour companies are not regulated by the Federal Aviation Administration, so training models vary. Because of their size and weight, helicopters can be affected more severely by changing weather patterns. Since helicopters fly lower to the ground than plans, they run the risk of hitting buildings, land formations or other, unexpected objects. Our hearts go out to the victims and the families of the most recent crash. We know first-hand what kind of injuries their survivors may sustain, and how those injuries will affect them for the rest of their lives. Our firm has won jury trials involving these types of crash cases, including a crash that occurred at the Grand Canyon; we have personally seen the types of issues the survivors may face. It is our most sincere wish that all three of them make a full recovery. Plattner Verderame, P.C. is a full service personal injury law firm in Phoenix, serving clients throughout Arizona. To learn more about our services, or to speak with an experienced lawyer, please call 602-783-8793 or fill out our contact form.